Ernst Jünger (1895–1998) was a prominent member of the German nationalist Conservative Revolutionary movement of the 1920s that was opposed to the feckless Weimar Republic. The son of a wealthy chemist, Jünger rejected the staid bourgeois world of his upbringing and instead sought adventure wherever he could find it. Running away from home and joining the French Foreign Legion while a minor, Jünger was sent to Algeria and Morocco. Through the intercession of his father, Jünger got out of the Legion in time to join the German Army at the outbreak of World War I. It was the Great War that brought fame and glory to Jünger. As a young officer he was renowned for his bravery in the field, winning Iron Crosses 1st and 2nd Class as well as the Blue Max (Pour le Mérite). It was Jünger’s wartime memoir Storm of Steel (In Stahlgewittern, 1920) that made his reputation as an author. In this book, Jünger describes war as an almost mystical experience, a transcendental transformation in which man becomes fully actualized. As such, Storm of Steel serves as a true antipode to the pacifism of Erich Maria Remarque’s All Quiet on the Western Front (Im Westen nicht Neues, 1929). After leaving the German Army in 1923, Jünger continued his literary efforts and did advanced study in a variety of scientific fields, most notably entomology (a field in which his work was highly regarded). Although his glorification of war struck a chord with Hitler, several times Jünger turned down the Führer’s offer of a parliamentary seat among the Nazi rolls. Jünger never joined the Nazi Party and was highly critical of many Nazi policies. Re-entering the German Army after the outbreak of World War II, Jünger was assigned to an administrative position in occupied Paris. Tangentially associated with the Stauffenberg Plot, Jünger was allowed to resign from the army in 1944 rather than face execution. Untainted by Nazism, Jünger continued his literary career after WWII and became a lionized figure in German cultural affairs, although many leftists considered him suspect due to his promotion of German nationalism and martial virtues. Passing away at the age of 102, Jünger was both the youngest ever recipient of the Blue Max and the last surviving recipient of the award. 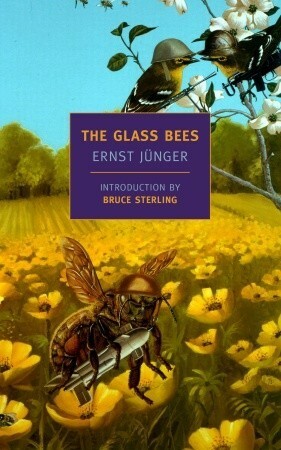 Jünger’s little-known novel The Glass Bees (Gläserne Bienen, 1957) is one of the most remarkably prescient literary works concerning the deracinated corporate-run globalist consumer dystopia in which we find ourselves currently imprisoned. The novel is set in an unspecified present in which one corporation headed by a man named Zapparoni controls all entertainment and information flow and produces miniaturized robots that perform most manual labor. When thinking of Zapparoni, think of a combination of Walt Disney, Mark Zuckerberg, Jeff Bezos, and Steve Jobs. Zapparoni’s corporation not only produces those machines that replace human labor, it also produces the entertainment that keeps the masses occupied while being displaced by those machines. But there is a weakness in Zapparoni’s business model. While Zapparoni may be an entrepreneurial visionary, he is an organizer, not a creator, and is dependent on the engineers and developers that he employs. In order to maintain his monopoly, Zapparoni must continually cater to the whims of his engineers, who are paid lavishly, have no set working hours, and are indulged in every conceivable manner, not unlike the Silicon Valley corporate campuses of today that resemble entertainment complexes more than workplaces. Even in peace they had brought about greater evils than any tyrant or warlord had ever imposed; they prepared poisons which no one before had ever imagined or even known by name. Each day their machines took a toll equal to the casualty list of a single battle, and the yearly toll equaled that of a war—and in what a ghastly manner. Captain Richard, however, is down on his luck and desperately needs a job, but the skill set of a retired cavalry officer is of little use in a world that has divorced itself from tradition, honor, and the natural world. An old army friend with connections arranges a job interview with Zapparoni who is in need of someone with the Captain’s tainted background. In what must be the most unusual job interview in literary history, a psychological tug-of-war begins between the Captain and Zapparoni, the results of which I will leave up to the reader to discover on his own. So much of speculative fiction which tries to imagine the future ends up being risible only a few years after it is produced. The Glass Bees, however, is remarkable for how accurate a portrait of the future internet age could be that was written in 1957 by a 62-year-old man with roots in the Wilhelmine Era. Even more remarkable is that Ernst Jünger lived for forty more years and got to see most of his dystopian vision come to fruition.